My beef production – entrepreneurship SAE consists of three different aspects: feeder cattle, crossbred cows and show cattle. The first part is my 25 crossbred feeder steers and heifers that I buy to background, finish and sell at a market weight. The second is my crossbred cow-calf herd that I have grown over the years through retaining past show heifers. Finally, each year I buy a crossbred show steer to exhibit at the local, district and state levels. 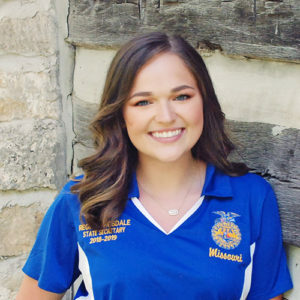 During my year of service as a Missouri FFA State Officer, I hope to encourage and inspire FFA members from across the state to learn their value. To be able to support each member in exploring their love and passion for the agriculture industry is such an honor. I cannot wait to motivate, meet and lead Missouri FFA members. Motivation is easy when you have such a great support system. Growing up in a family full of individuals who know the value of hard work and dedication is something I have been fortunate to have. My parents have worked tirelessly, passionately and sacrificially to ensure that Ryan, Reid and I could embrace every opportunity that comes our way. It is because of this that I work each day to be humble, determined and selfless in everything that I do. After graduating from the University of Missouri – Columbia with a major in agribusiness management, my hope is to obtain a position in the global agriculture system. Establishing myself in a career where “ag”vocating is a prominent part of my job responsibilities is what I plan to strive for. Telling the story of farm to table is important to sustain the industry and the image of agriculture. Back in the day, Hannah Montana’s song, “Best of Both Worlds” truly hit my soul. I loved nothing more than going out and working with my show steers, but I also loved going to dance class on Wednesday nights in Columbia. For nine years, dance gave me girls who I could talk to about my cows, especially since most had never even seen a cow. There was a time when I knew I was going to be a YouTuber who filmed makeup and cow videos. Dance fostered my love for all things beauty, fashion and farming. “The doors will be opened to those who are bold enough to knock.” This quote is the epitome of any advice I could give you, Missouri FFA members. Taking every opportunity that comes to your doorstep will only make you a better person, leader, agriculturist, friend and innovator. It is my hope that each of you will jump at the chance to tell your story, exhibit your skillset, and build new relationships.